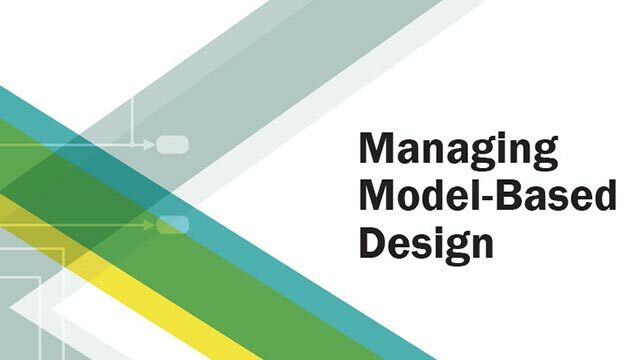 This model illustrates Simulink® variant subsystems. Variant subsystems let you provide multiple implementations for a subsystem where only one implementation is active during simulation. You can programmatically swap out the active implementation and replace it with one of the other implementations without modifying the model. A Variant Subsystem block contains two or more child subsystems where one child is active during model execution. The active child subsystem is referred to as the active variant. You can programmatically switch the active variant of the Variant Subsystem block by changing values of variables in the base workspace, or by manually overriding variant selection using the Variant Subsystem block dialog. The active variant is programmatically wired to the Inport and Outport blocks of the Variant Subsystem by Simulink during model compilation. in the base workspace, activates the VSS_LINEAR_CONTROLLER variant. The condition argument can be a simple expression consisting of scalar variables, enumerations, equality, inequality, &&, , and ~. Parenthesis () can be used for precedence grouping. To specify the Simulink.Variant objects association for the Controller subsystem, right-click on the Controller subsystem and select Subsystem Parameters, which will open the Controller subsystem block dialog. The Controller subsystem block dialog specifies two potential variants. The two variants are in turn associated with the two Simulink.Variant objects VSS_LINEAR_CONTROLLER and VSS_NONLINEAR_CONTROLLER, which exist in the base workspace. These objects have a property named Condition, an expression that evaluates to a boolean and that determines which variant is active. The condition is also shown in the Variant Subsystem block dialog. In this example, the Condition properties of VSS_LINEAR_CONTROLLER and VSS_NONLINEAR_CONTROLLER are VSS_MODE == 1 and VSS_MODE == 2, respectively. The variable VSS_MODE resides in the base workspace, and can be a standard MATLAB variable or a Simulink.Parameter. If there is no associated variant object or a '%' (comment) character prefixes the variant object in the Variant Subsystem parameters dialog box, then the child subsystem is considered commented out and is not used during model execution. Within a Variant Subsystem block, you can place Inport, Outport, and Subsystem blocks. 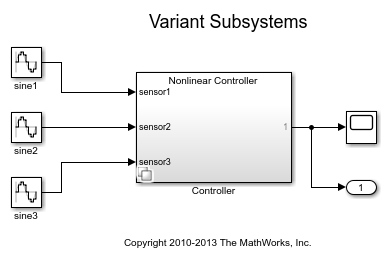 In this example, the Linear Controller Subsystem block is associated with the variant object, VSS_LINEAR_CONTROLLER, and the Nonlinear Controller Subsystem block is associated with the variant object, VSS_NONLINEAR_CONTROLLER. Signal connections are not allowed in the Variant Subsystem. Simulink programmatically wires up the Inport and Outport blocks to the active variant when simulating the model. in the base workspace and then simulate the model. 1. Enumerations: MATLAB enumeration classes can be used to improve readability in the conditions of the variant object. 2. 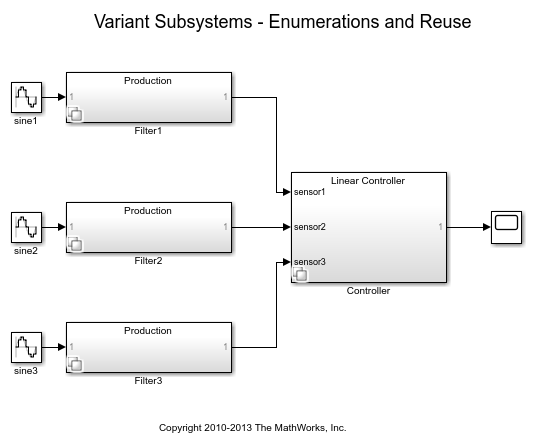 Reuse: Simulink.Variant objects can be reused in different Variant Subsystem blocks. In these Simulink.Variant objects, we use the enumeration classes, sldemo_vss_BUILD_TYPE.m, and sldemo_vss_CONTROLLER_TYPE.m to define the Simulink.Variant Condition parameters which improves readability. The three filter Variant Subsystems blocks, Filter1, Filter2, and Filter3 all use the VSSE_PROTOTYPE and VSSE_PRODUCTION Simulink.Variant objects. You can use the Simulink® Coder™ to generate code from a model containing Variant Subsystem blocks. By default the generated code contains only the active variant. Alternatively, you can generate code for all variants guarded by C preprocessor conditionals (#if, #elif, #endif) when using the Embedded Coder™. To generate preprocessor conditionals, the types of blocks that you can place within the child subsystems of a Variant Subsystem block are limited. During the code generation process, one Merge block is placed at the input of each Outport block within the variant subsystem and connected to the child subsystems within the variant subsystem. Thus, the restrictions placed on Merge blocks apply to the contents of Variant Subsystem blocks. The restriction checks are only performed when generating code. In addition, the child subsystems of the Variant Subsystem block must be Atomic subsystems, which are created by selecting the Treat as atomic unit parameter of the Subsystem parameters dialog box. Embedded Coder target is selected on the Code Generation pane of the Configuration Parameters dialog box. The Override variant conditions and use following variant is not selected on the Variant Subsystem block parameter dialog box. When code generation of preprocessor conditionals is active, the generated code contains all child subsystems of the Variant Subsystem blocks protected by C preprocessor conditionals. In this case, the selection of the active variants is deferred until compile-time of the generated code. Only one variant object which is encoded in C macros, must evaluate to true (be active). See the Embedded Coder documentation for more information on code generation for variant subsystems.